Today must have been Android App Update Day at Google: we saw new versions of Listen, Shopper and Voice hit the market. Of these, Voice saw the most significant changes. Previously, alerts of new voice and text messages were pushed out every fifteen minutes. In fact, I had turned them off, since alerts hit my phone via email more quickly than native Google Voice alerts. But if you enable Inbox Synchronization in the new version of the app, alerts will hit your phone within seconds. And turning on this feature will also tell Voice to stop forwarding text messages to your phone, handy if you are allotted a limited number each month. Besides this speed boost, the new version of Voice also adds a handy contact strip that pops up when you tap a contact’s avatar within the app. 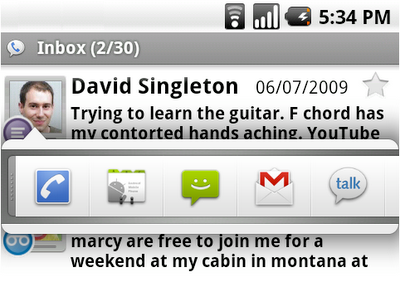 If you’ve used a Nexus One, you’ll recognize this easy way to choose how you want to get in touch with someone. While these changes are welcome, I’ve heard recent complaints that Voice is not more deeply integrated with Android, and that the transcriptions are still more humorous than useful. If you use the Google Voice app, what’s your opinion of it?